Even the rain couldn’t prevent us from enjoying our time at Kawai Purapura last weekend. We set up our stand on Thursday and since then we got a lot of positive comments on our inspirational decor. Over the weekend we showed and explained our latest Yoga and Meditation products, had great conversations, learned a few things about life in general and met a lot of wonderful like-minded people. We really enjoyed the peaceful setting of the retreat in Albany and we had a quiet moment under the huge peace tree to reflect. And just on time for the closing ceremony the sun came back. It was the perfect 'get away' from our busy lives. Last weekend my sister and I had a very peaceful and quite time at MANA Retreat Center on Coromandel. Self-care and restoration was the focus for three days, organised by Caroline from YummyYoga and her magic helpers Machel and Nicki. 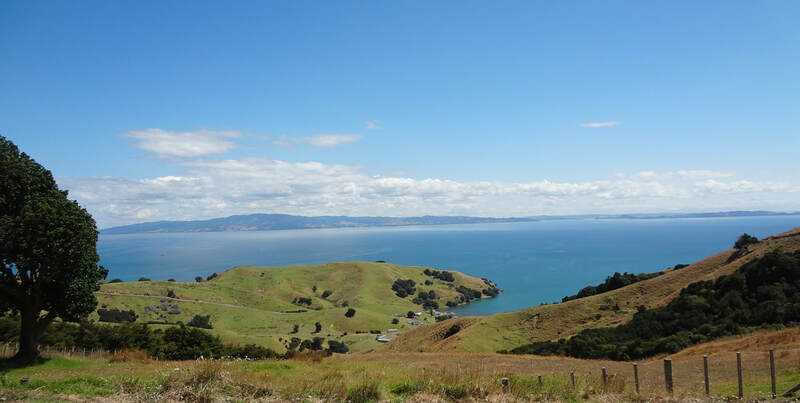 After driving along along the beautiful coast from Thames to MANA, we enjoyed lots of Yoga, Meditation, a bush walk, the amazing sanctuary on the hill, vegetarian food and wonderful, like-minded people. It was the well needed relaxation before setting up my stand at the International Yoga Festival at Kawai Purapura in Albany tomorrow. Thank you to Caroline, Machel and Nicki to help create a ‘very special memory’. 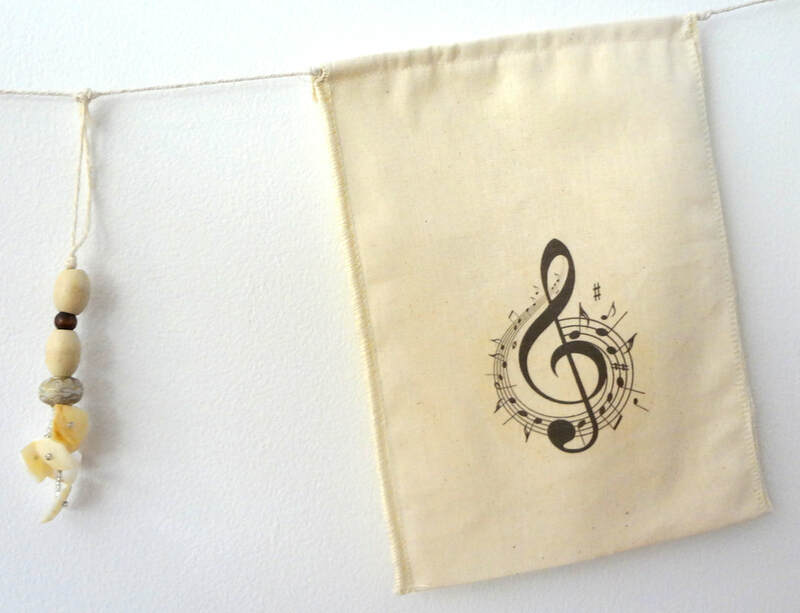 These newly created fabric buntings are now available in my online store. 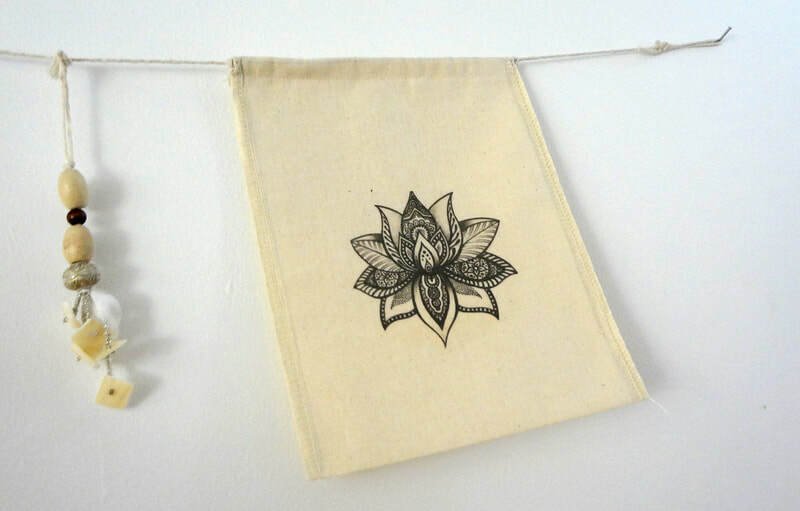 Since I made similar buntings to decorate my stall at the International Yoga Festival and other shows, markets and events, people asked me if they were for sale. Now they are! 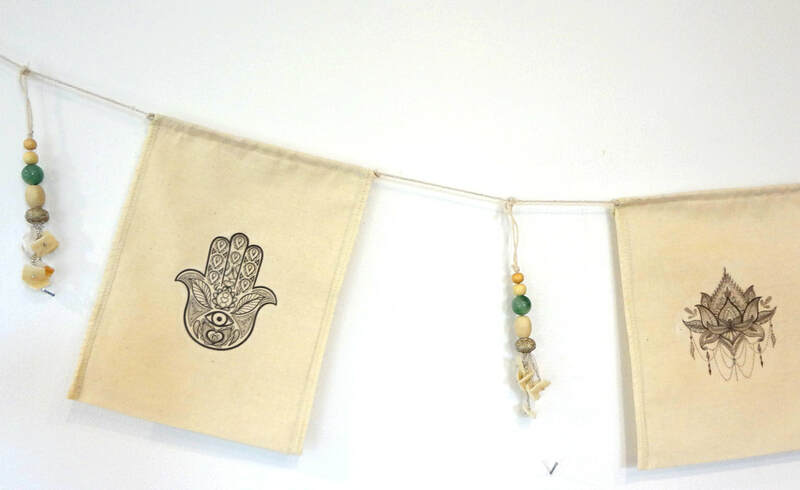 Each listed bunting includes eight calico flags with different motifs and seven bead&shell tassels. They have a total length of approx. 3.00m and they are all hand-made in my home studio here in New Zealand. ​NEW inspirational FUNDRAISER hearts available for Elize, the fourteen year old local girl, fighting Leukaemia. If you are interested in buying these hearts for $5 each, please contact me. All proceeds go to Elize's Give a Little Page. 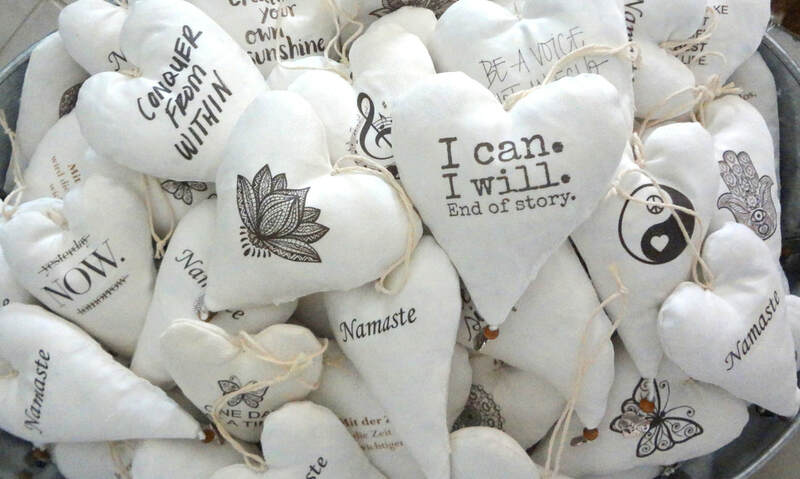 The hearts will also be available at my stand at the International Yoga Festival at Kawai Purapura in Albany (21.-24. February 2019). 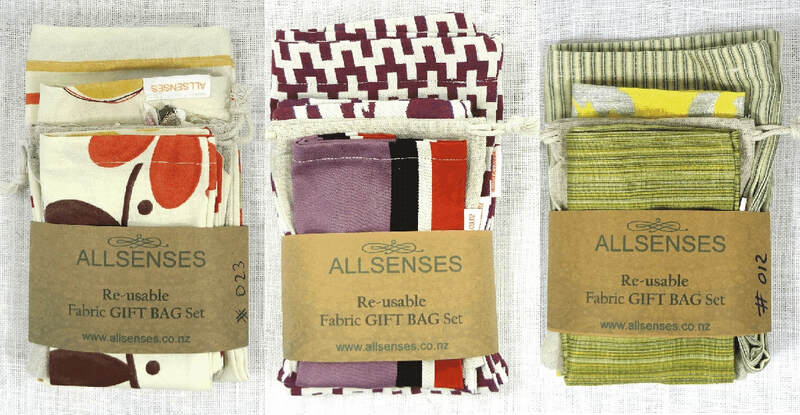 Now available in my Online Store: Recycle, save the trees and reduce carbon footprint by using fabric gift bags. Each Set includes 3 hand-made fabric bags in different sizes, 1 tassel, 3 cotton straps and a small linen bag for gifting money. Each set is different in style, fabric, colours and sizes. Please see listings for details. Starting your own Yoga studio? 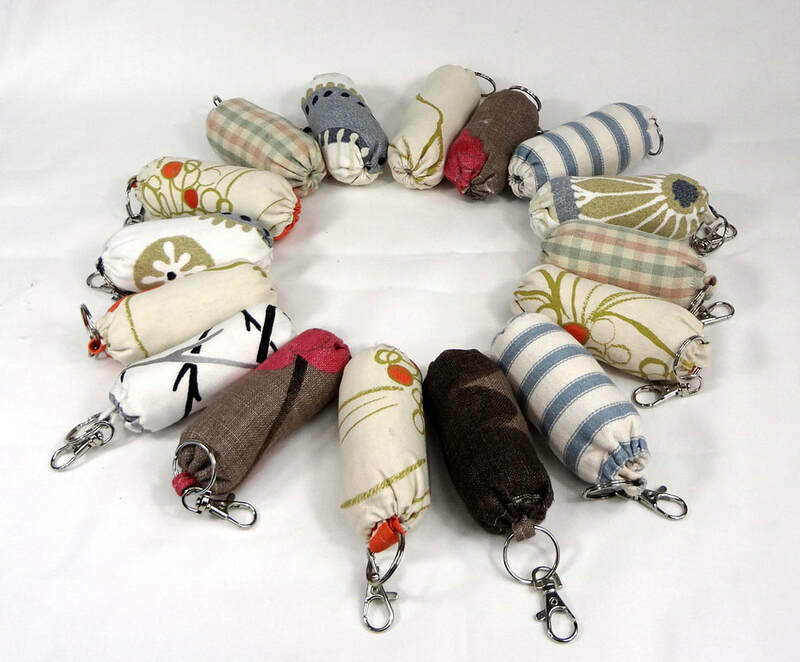 I just finished the first edition of little hand-made cushion key rings. The exclusive Gold Brocade fabric comes in four colours: navy, green, purple and beige. The cushions are approx. 8x5cm and each one is different due to cutting the large fabric patterns. 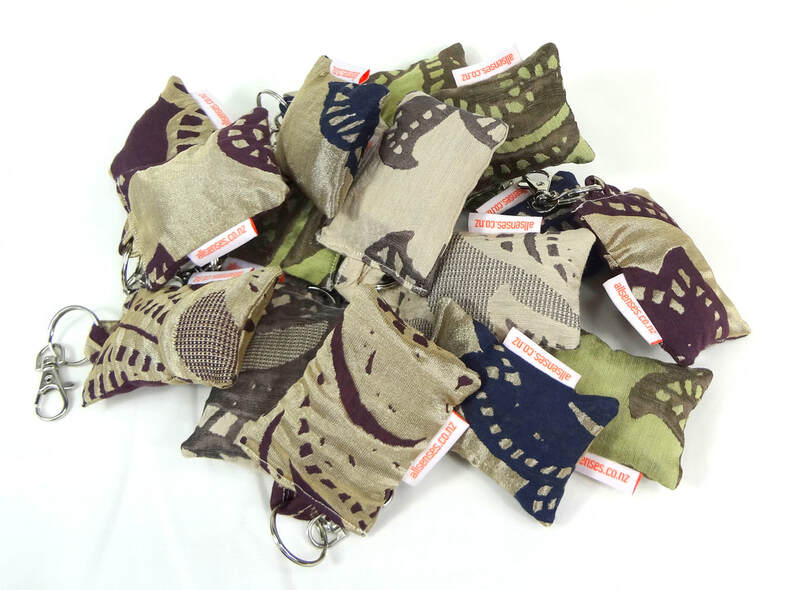 The cushion key rings are $6 each and available under GIFTS in my Online Store. These eye pillows promote relaxation and stress relief, help with headaches and block light from your eyes while the gentle weight provides a calming acupressure effect. They are perfect for Savasana at the end of your Yoga session. 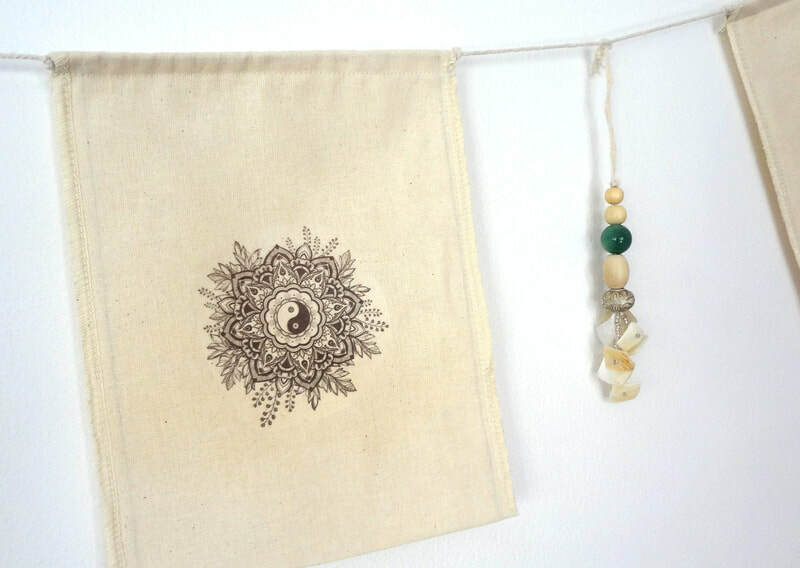 Take your own eye pillow to Yoga class. They are also ideal for lying poses during guided meditation or just allow yourself a few minutes time out from a stressful day, while listening to calming music. 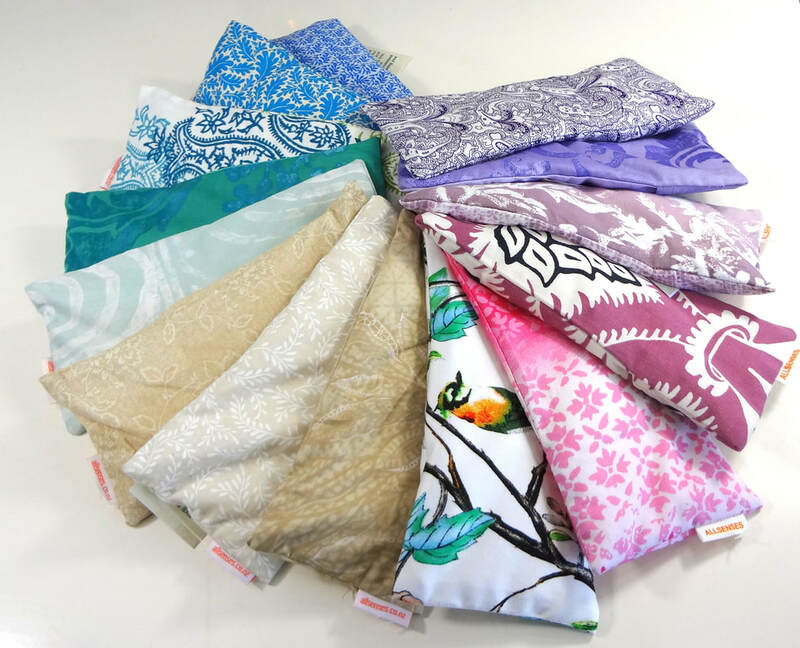 All eye pillow covers are made of 100% Cotton and are removable for washing. The cotton insert is filled with white rice and a hint of dried lavender from my garden. Enjoy! What a crazy year! 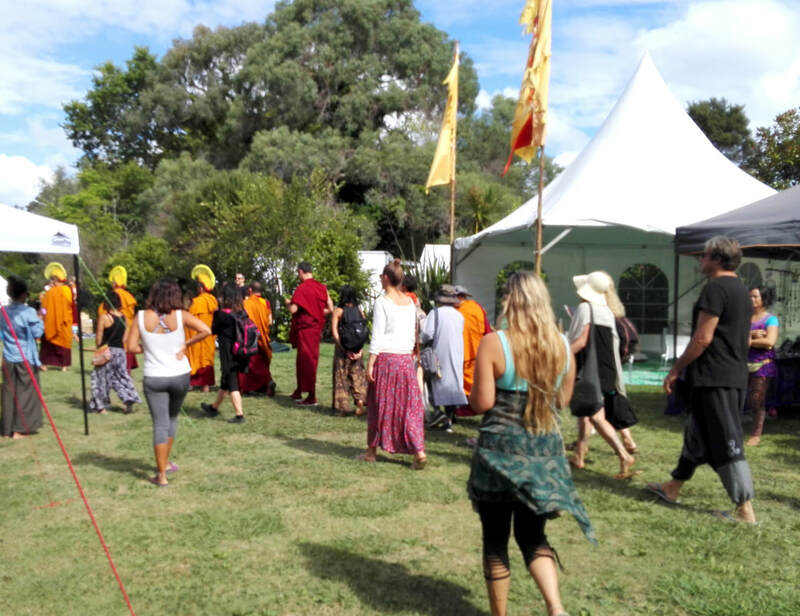 At the Grey Lynn park Festival we needed gumboots and NZ Yoga Day at Western Springs was postponed and I couldn't go. 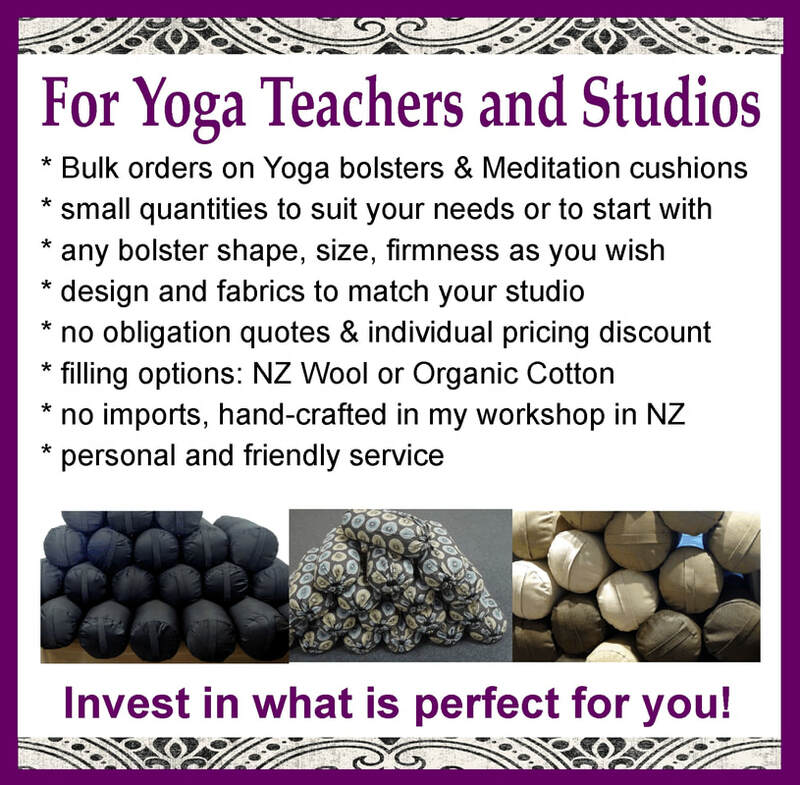 I made linen bolsters for a hand-made Montessori bed, customised cushions, Yoga bolsters for several Studios, improved the meditation sets with new fabrics and designs and at the same time I started planning new products for 2019. My new items will be exciting, if you care for the environment and like the idea of recycling. 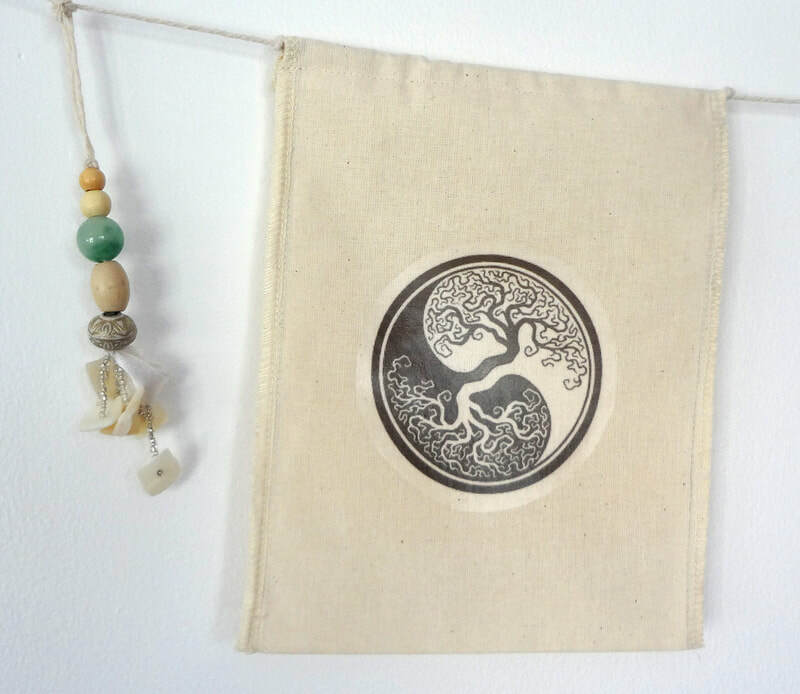 I will launch some of the new products at the International Yoga Festival in Albany in February 2019. When I started my business beginning of the year, I had no idea where it would take me. Now I feel, I have made the right decisions. I am on an exciting and passionate journey, business-wise. 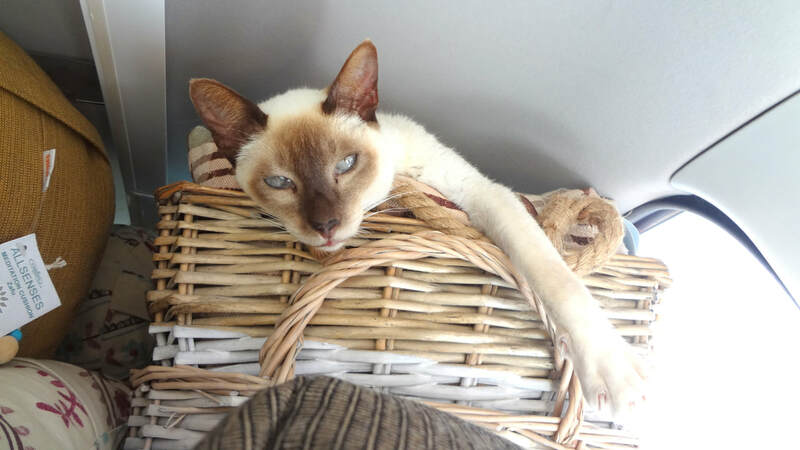 In my personal life I am still dealing with grief and re-organising my life without my husband Bernie. I met wonderful people, got inspired and I even made new friends along the way. The year went fast and I would like to thank every customer who bought my bolsters and cushions, I also thank my friends for their support and help over the year. I couldn't have done it without you! Also a big Thank you to everybody who bought my little inspirational fundraiser hearts for Elize. This inspired me to organise even more fundraising and donation projects in the New Year. I will be back at the sewing machine, working on custom orders, new releases and prepare for the Yoga festival at Kawai Purapura. All the best, enjoy your time off, thank you again and I hope to see you all in 2019.